They’re something we all get but never really talk about. Today we’re breaking the taboo and loading you with email marketing info. 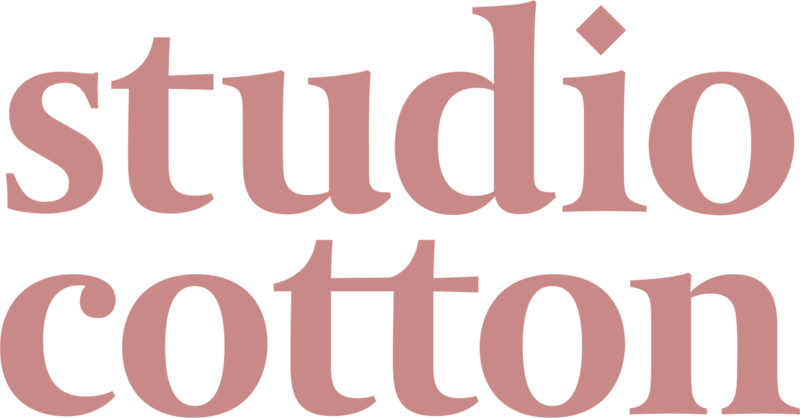 Welcome emails are a vital part of your toolkit that you need to exploit if your small creative business has a mailing list. 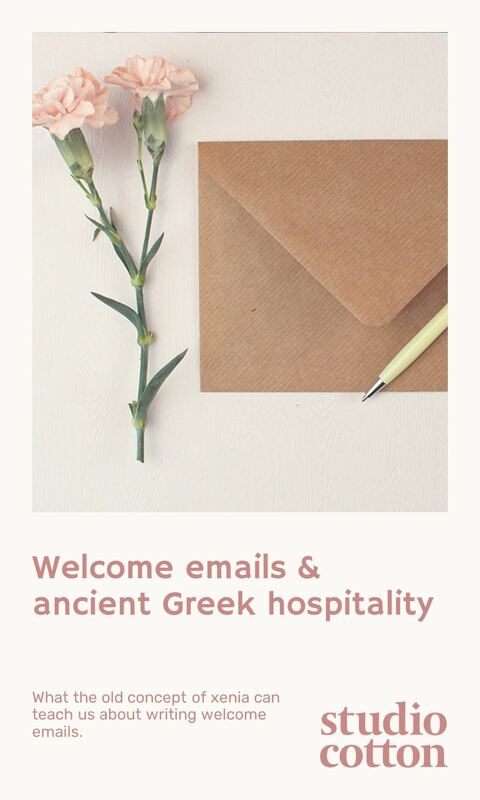 We’ll be taking a look at some of my fave welcome emails and how I think ancient Greek hospitality can provide some super tips on creating your email. 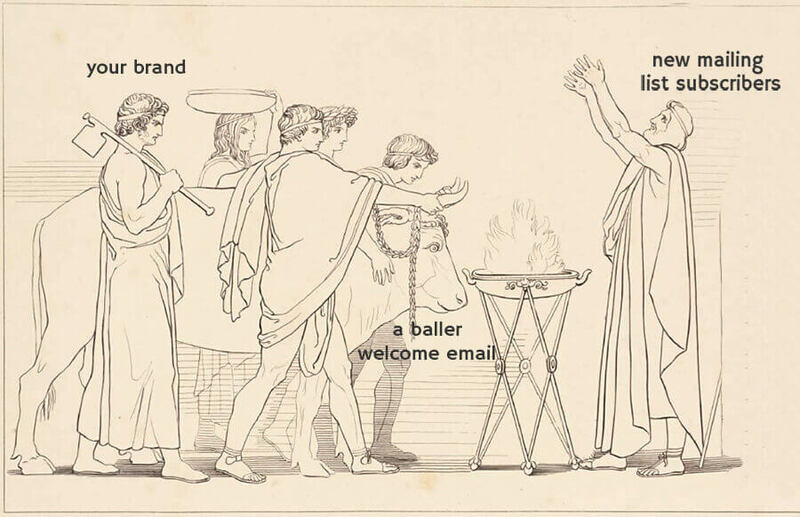 What’s so great about welcome emails? This super statistic means welcome emails are extra effective, when done right, at increasing the likelihood of leads clicking and viewing your content, and thus the conversion from lead to client. I won’t lie to you, although I know the value of my personal data, I sign up to every mailing list in the hope of some sweet, sweet deals. I notice that if I don’t receive an automated welcome email, I forget I’ve even signed up. If I open a welcome email and it’s a dull, lifeless string of text and images, I’ll just assume the subsequent emails will be the same quality and that the content isn’t worthy of my time. I can’t be the only one who doesn’t unsubscribe, but instead, deletes all the unread emails from brands who have not impressed me. So, it goes without saying that the pressure to make a baller impression with your welcome email is at a meeting-your-parents-in-law-at-Christmas level. 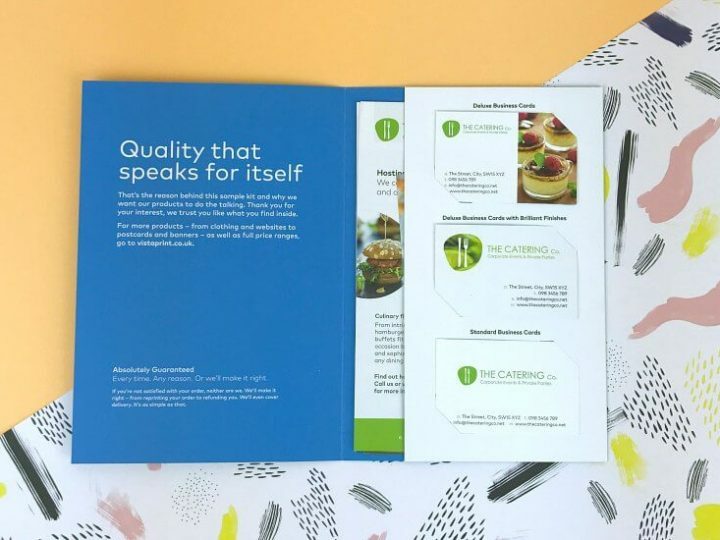 Xenia‘s all about hospitality; making your guests feel welcome by displaying your generosity and establishing how welcome they are in your home. If you’re a fan of ancient literature like I am, you know that poor old shepherds would display top-notch xenia when welcoming strangers into their house ( – I wouldn’t advise that part). These mysterious strangers often turn out to be deities or war heroes in disguise who return the favour with splendid gifts and incorporating the shepherds into the glorious stories of their travels. 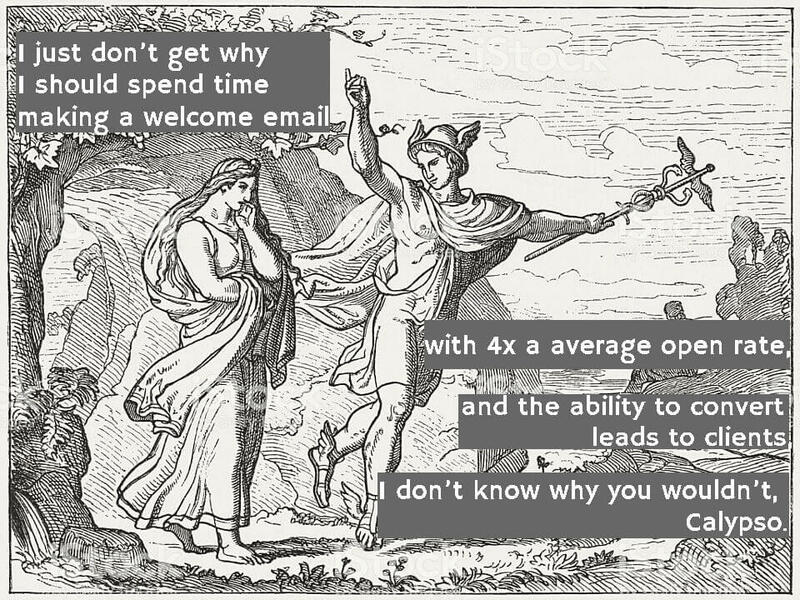 Now, I want you to think about welcome emails. As the shepherd, you want to make your new mailing list subscribers feel super welcome – as if they’ve joined an excellent community – and introduce your brand, bestow them with great deals and offers, and wow them with a gif or image that you’ve put a lot of effort in to. …through simply spending a little time on making sure your new lead feels welcome. 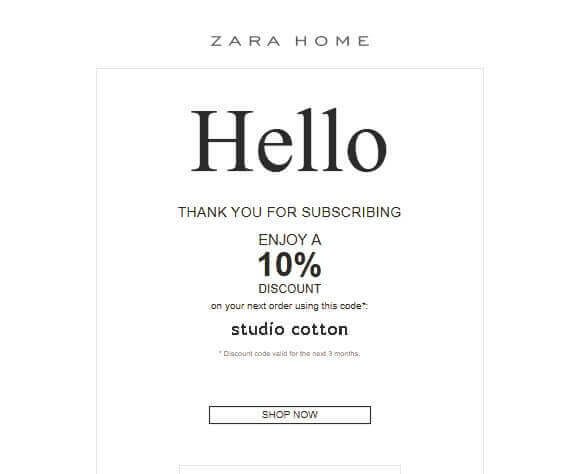 Now, let’s get into the design of your emails. Whatever option you choose, you must deliver something of value and end with a call to action. 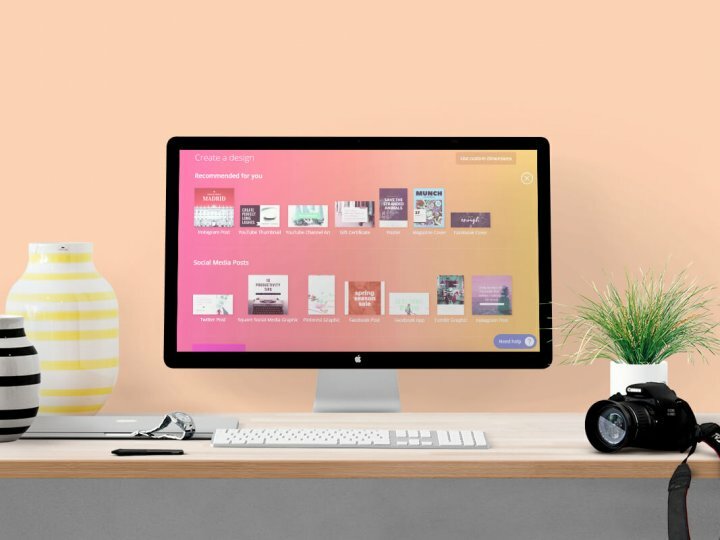 If you’re using MailChimp and struggling to create a phenomenal email design, we’ve got you covered with email template advice on our blog. 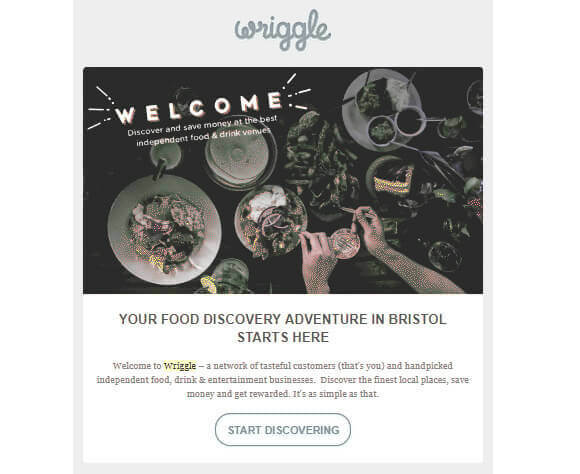 You need to nail your title and tagline to hook the reader on to click your email rather than immediately hit the bin button. Then you need to make sure your content is extra awesome to showcase the quality of content you will be mailing over to their inboxes every month. I’ve delved into my inbox to fish out my top welcome emails and briefly analysing why I find them effective, so that you can take note and adopt some of their techniques. Cool Image – who doesn’t like looking at high-quality crushed make-up (as long as it’s not your own)? 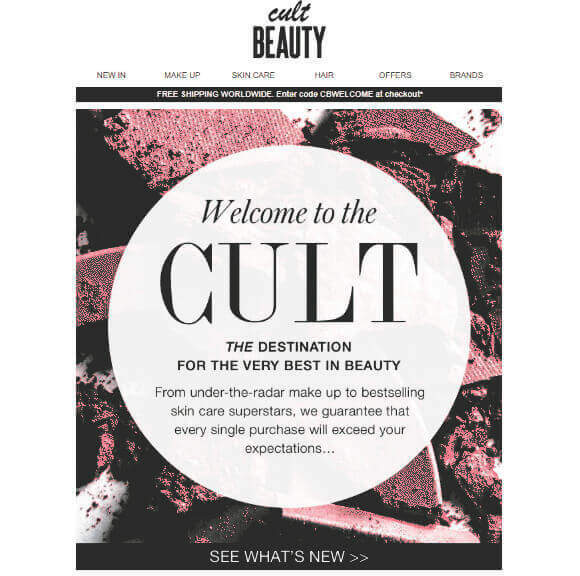 Now you know all about the welcome email, make sure you utilise their unique power by showcasing your brand identity, making your lead feel super special and showing off how welcoming you are. 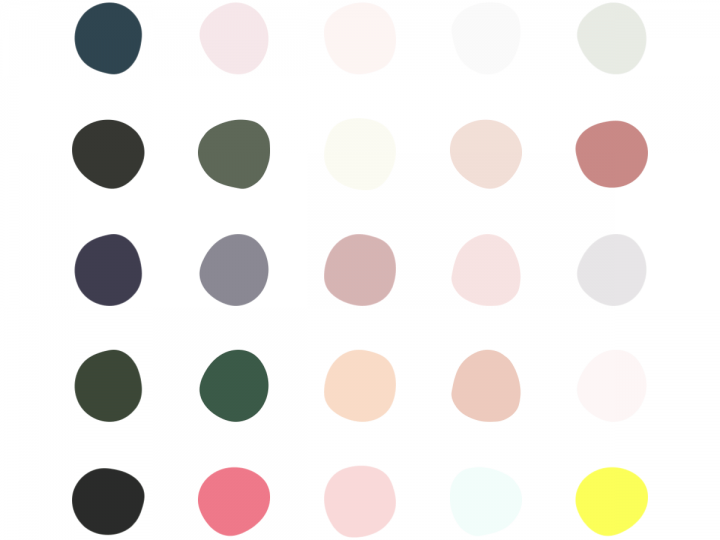 Choose a message and design your email around this, making sure to include stunning imagery or gifs, keeping it short and sweet, and ending with a call to action that leads to your social media, shop, or website.